In early May, Paula Fitzpatrick generously donated her time and energy while volunteering with TTL for a few weeks. Her second time in Lesotho (the first time as a Peace Corps Volunteer), we are happy to be able to share her reflections about her time in Lesotho. Thank you Paula for sharing your insights, thoughts and feelings about Lesotho with the TTL community. “How was it Paula, your trip to Lesotho?” I’ve been asked that dozens of times since I returned the 14th of May, my youngest son’s birthday. Everyone truly wants to know and the question has started many thoughtful conversations. I stumble over the words to say, “Incredible? Awesome? Tragic?” I try not to minimize the struggles of the Basotho and the future of their beautiful, smiling culture. But as my husband helped me realize…I had fun and much more. Lesotho looks very much the same as it did 25 years ago. There are still cows in the city, still mud huts, still villages without outhouses, and schools without electricity. There is a mall in the capitol now and you will see mud homes with solar power or even a satellite dish. People communicate with cell phones in some places too. Still my impression during my short visit was one of sameness and familiarity. Maseru looked grayer, sadder, poorer, worldlier, an innocence lost. I would like to share some scenes from Lesotho. I will try not to stumble. Thirteen young children in varying degrees of illness, some HIV positive, most malnourished…wow how could I look at these beautiful dark faces and not cry out, WHY?? Everyday I spent as much time as I could, playing with the children. “Lumela bo-me.” My Sesotho came back very rapidly. Insufficient as it was 25 years ago, I felt thrilled to be able to communicate with the lovely women working at the Safe House. They chatted with each other, “She can speak Sesotho.” “Only a little,” I would say. “No very much,” they would smile. One afternoon sitting in the too warm playroom with little ones crawling over me, ‘Me Mamosa walked in and began to sing. For some minutes the playroom was filled with the women singing and the children dancing. Their voices harmonized with strong, happy melodies. The TTL Safe House is a refuge for the women who work there too. Eleven Basotho women met up with our Outreach group in Thaba-Tseka’s small clinic. They came to have their children weighed and measured. Many walked most of the morning to arrive at the clinic and receive TTL’s support. They were all so grateful. We returned to the Safe House with two children who needed more care than their caregivers could provide. Touched by this separation of mother and child, I asked, “How do they feel when they give up their child, if only for a short time?” The driver said the mothers know they will be taken care of and will return home to them healthier. With TTL there is hope for their children. I worked a bit with the schools in Mokhotlong while I stayed at the Safe House. The elementary school close by is starting a library. The headmaster has cleaned out a large, nicely lit room and has started to make shelves for the incoming books. There were only a few boxes of books on the floor, but he has hope to have a full library soon. The teachers I spoke with see a great need for the children to have fiction books that they can enjoy reading in English. The school was overflowing with children, all of its classrooms too crowded. In my conversations with the adults in the school I could feel their concern for the future and their love for the children they teach. The headmaster asked the older children to sing for me. The songs they chose to sing were about people of the world working together because we all need each other. Early May is harvesting time. I took an outreach trip down a nonexistent road and noticed a group of men cutting wheat. We were going slowly enough that I could get a good view. They were cutting in rhythm, swinging up, swinging down, laying down the handful of wheat, taking a step, swinging up, and swinging down, again and again. In a line, these men were working, in sync, in the sun, all by hand. And they were singing! Beautiful, deep voices. ‘Me Palesa commented, “Mamelo, you are too old for that.” I was tickling her check trying to help her sleep. She is four. The children of Lesotho grow up fast. There are herd boys of eight and seven year olds with an infant on their back. They get prepared for a hard life early. Now, surrounded by economic hardships, poor crops, the lack of good roads, the lack of health care, they are battling AIDS. A generation on the brink of extinction is sharing this wasting disease with its offspring. Still, the women who care for the children who are sick, some dying in their arms, SING. The hard working men in the fields- SING. The children hoping to learn and make something of their lives- SING. Because we are human, we have hope. Touching Tiny Lives’ Safe House is working. 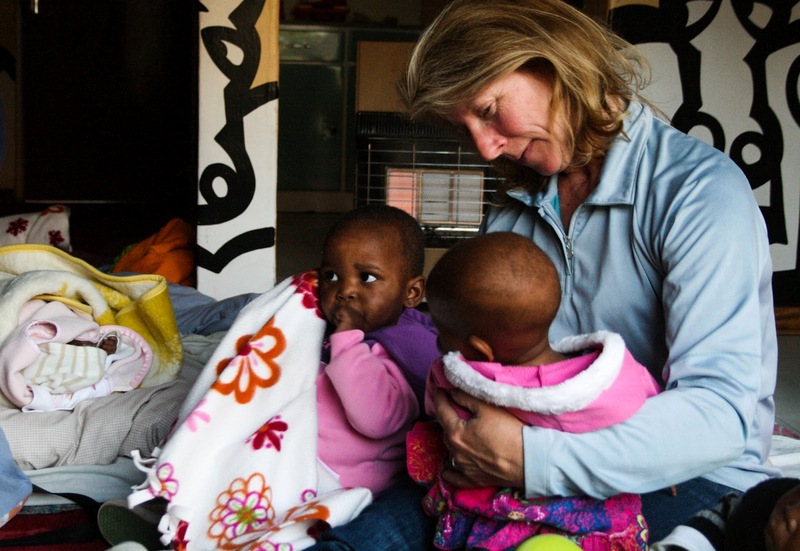 It works because of the women who daily care for the children who are sick and dying. With their love and care they save lives. It can’t get any more important than that. That is how it is in Lesotho. Visit the Touching Tiny Lives Foundation to learn more about our "No Mountain Too High" campaign! Beautiful post, Paula. Thanks so much for sharing that, and I'm so glad you had a good experience at TTL. I can't wait to make my own return trip!